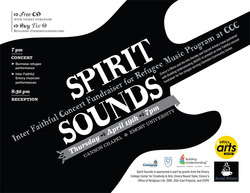 In partnership with Emory's Ethics and the Arts Society and Sacred Artistry, Building Understanding (BUDS) presented an inter faithful concert fundraiser for a refugee music program at the Clarkston Community Center. - 10am Tuesday, May 8. AIB Metro will then re-air in those same time slots the next week.